Wind power output collapse the culprit. Whichever way you slice it (and it’s been cut from every possibly exculpatory angle), South Australia’s infamous Statewide blackout on 28 September 2016 was due to the inability of its 18 wind farms to tough out a typically vigorous spring storm front. Where conventional generators have no difficulty chugging away in bad weather, ‘systems’ that depend entirely upon the vagaries of nature will always struggle. Tinkering with wind turbine software settings doesn’t make the wind blow fast enough to get these things up and running or to stop blowing too hard: at 25m/s – or 90km/h turbines shut down for reasons of self-preservation. In its final report – available here: Integrated Final Report SA Black System 28 September 2016 the AEMO (which pushes wind power because its members do) went to extraordinary lengths in its attempt to exonerate SA’s wind farms, but the efforts by SA’s hapless Labor government to do likewise were even more so. 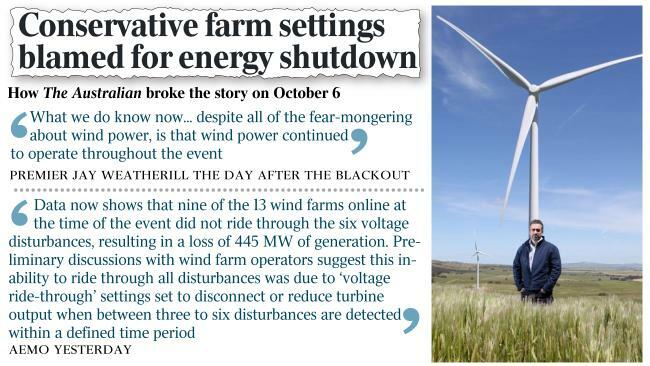 Overly sensitive control settings on wind farm turbines led to last September’s statewide blackout in South Australia — not wild storms — highlighting problems with the state’s high level of ­renewable electricity generation, a key report says. 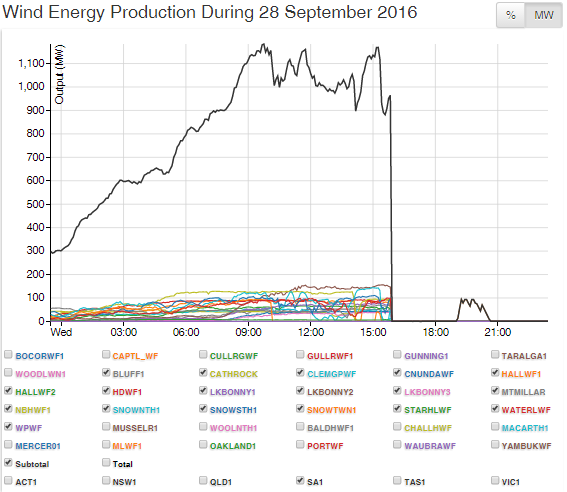 The fourth and final report by the Australian Energy Market Operator into the September 28 event found wind farm settings “responding to multiple disturbances … led to the Black System”. 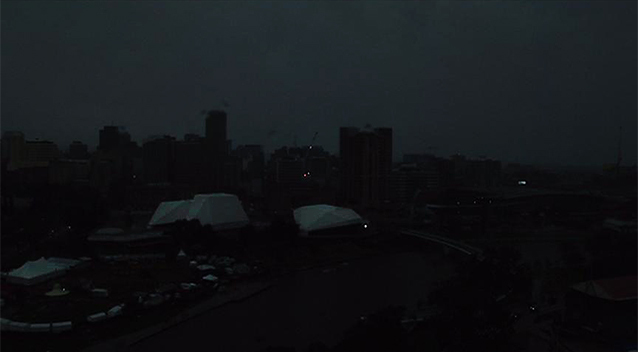 This is despite South Australian Premier Jay Weatherill ­repeatedly insisting that renewables had not contributed to any blackouts and storms were solely to blame. Although the report said “wind turbines successfully rode through grid disturbances”, it found a “reduction in wind farm output caused a significant ­increase in imported power flowing through the Heywood interconnector” and caused it to trip, leading to the statewide blackout. “Had the generation deficit not occurred, AEMO’s modelling ­indicates SA would have remained connected to Victoria and the Black System would have been avoided,” the report found. The report highlighted the “technical challenges” of a rapid uptake of renewable generation and the need for a co-­ordinated, national planning ­approach for “energy transformation”. An unrelated report by AEMO and transmission company ElectraNet, published in ­October 2014, had warned of this scenario. The report had warned that because of the state’s high level of wind and solar generation, “SA can separate (from the national electricity market) “due to the credible loss of the Heywood ­interconnector”. 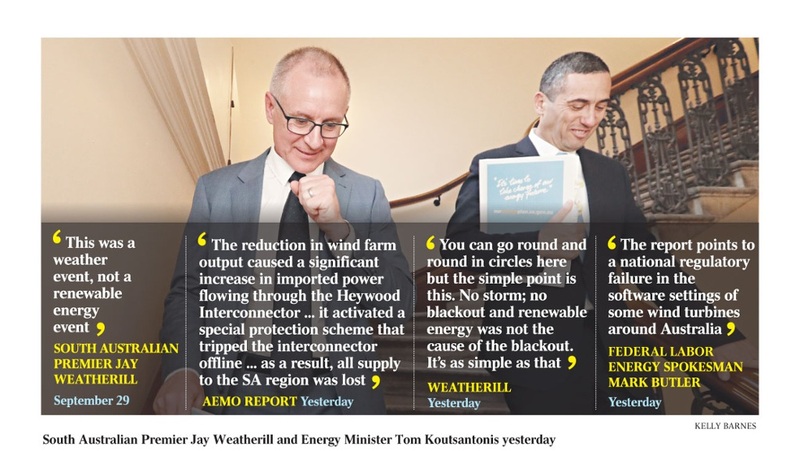 Yesterday in Adelaide AEMO chairman Anthony Marxsen said previously unknown and overly sensitive protection mechanisms on nine wind farms had caused the blackout, and not the weather, as federal and state Labor claimed. “Frankly, if we had known we were going to lose three transmission lines due to tornadoes, we still would have been relatively confident that the grid would ride through that without impact,” Dr Marxsen said. Federal Labor’s energy spokesman Mark Butler said the software setting problem, since fixed, was “a national regulatory failure”. AEMO was “working with industry on ways to use the capability of these new types of power generation to build resilience”. However, Mr Weatherill yesterday maintained, “no storm, no blackout”. “Renewable energy was not the cause of the blackout. It’s as simple as that,” he said. SA Energy Minister Tom Koutsantonis claimed the report as a “complete vindication of what this government’s been saying”. SA Opposition Leader Steven Marshall said the Premier’s claim that wind farms were in no way responsible for the statewide blackout “has been totally discredited”. “AEMO’s report makes clear that had nine wind farms not tripped unnecessarily there would not have been a statewide blackout,” Mr Marshall said. The report identified three factors to stabilise the wind-reliant grid and made seven further recommendations, including improved wind-speed forecasting. Of the 19 recommendations in AEMO’s four reports, three have been implemented. Work has started on a further eight, with the remaining items due to be completed by December. AEMO said the blackout had highlighted the challenges associated with keeping the electricity grid secure, particularly during extreme conditions, as Australia moved to using more renewable energy. It said traditional gas or coal power plants could no longer be solely relied upon to keep the ­nation’s power grid strong. Federal Energy Minister Josh Frydenberg said the blackout ­remained a “wake-up call” that underlined the importance of maintaining the supply of reliable electricity. Predictably, this was enough for the South Australian Premier, federal Labor and the green Twitterati army to rejoice. They claimed vindication for an energy policy that has given the state one of the most unreliable power grids in the Western world. Conveniently, the Premier and his sycophantic Energy Minister Tom Koutsantonis chose to ignore the report’s key findings: that control settings on nine wind farms “responding to multiple disturbances” directly led to the statewide blackout, as they tripped the interconnector with Victoria. AEMO’s matter-of-fact chairman Anthony Marxsen said it was not tornadoes bringing down transmission lines that caused the blackout, but the way renewable generation responds to such disturbances. In this case, complex software settings were wrong. Let’s not forget the Premier has always insisted the blackout was entirely due to wild storms. He still maintains: “No storm; no blackout.” He is just plain wrong. The Premier and others also ignore a fact that goes to the root cause of the problem — the lack of conventional baseload generation. With less synchronous generation online, the report said, the power system is experiencing more of the problems that will lead to more blackouts. It’s too late to turn back the clock for SA, so AEMO is “working with industry on ways to use the capability of these new types of power generation to build resilience”. 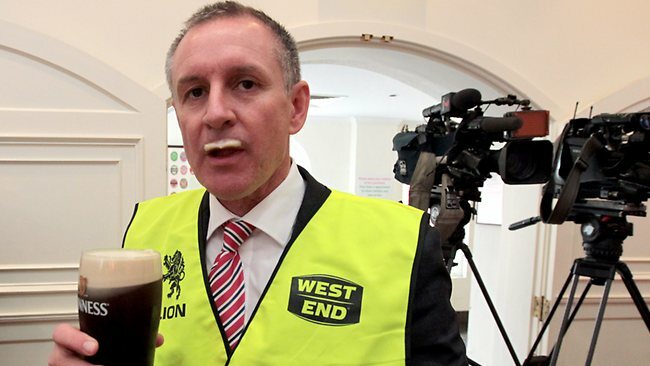 Jay Weatherill has run out of other people to blame. The South Australian Premier must face reality and deal with the dire consequences of his own energy policy mismanagement. As an evangelist for renewable energy he has charged headlong towards a renewable target of 50 per cent. The result is the nation’s most expensive and unreliable power and SA’s first statewide blackout or “black system”, as engineers dub it. Mr Weatherill first blamed the weather, then the market, then Canberra, and even accused this newspaper of running a “jihad against renewable energy” — so we figure he blames The Australian too. But the latest Australian Energy Market Operator report confirms SA’s electricity grid has been mismanaged; that the rush to renewables has left it weakened and vulnerable, and that the instability of wind generation was the key factor in the state’s unscheduled earth hours. AEMO and independent checks by Manitoba Hydro International find the “black system” was “triggered due to lack of inertia on (the) South Australian side once the Heywood interconnector tripped” and that “the cause of the black system was sustained power reduction of a number of wind farms” in SA. Once the interconnector was tripped, the state didn’t have sufficient “system inertia” to run the grid. Keeping synchronous power generation has long been seen as a central challenge in adding renewable energy. MHI suggests SA may need to identify “must run” thermal generators to do this. In other words, if its coal-fired or gas-fired generators had still been running, the grid would have had the required inertia. These, of course, had been forced into mothballs by subsidised renewable generation. The state is more reliant than ever on Victorian power and, as last year’s “black system” showed, it is less able to withstand breaks in that supply. A storm taking out power lines was always going to cut electricity to some areas but the failure of eight wind farms and the resultant trip of the interconnector turned this into a costly, damaging and dangerous statewide blackout. The state’s energy security remains perilous, its economy undermined and residents have every right to be angry. Many fixes are proposed, including improved fault mechanisms for wind farms and better wind forecasting. But only baseload generation can provide a foolproof and cost-effective long-term back-up for renewable intermittency. This is a timely lesson to Victoria and even Canberra as the massive Hazelwood coal-fired generator closes down in the Latrobe Valley in coming days. This closure will significantly reduce the amount of reliable baseload power available in the National Electricity Market. It means Victorians will be likelier to suffer some of the cost and supply problems experienced by South Australians and it will leave the smaller state even more vulnerable. It is an ill wind that blows on energy policy. Yet governments are standing by their renewable targets and looking on as baseload generators switch off. Weatherill’s ‘wonderland’, where wind power can do no wrong. We are again seeing the uselessness of AEMO as they spruik wind power in SA, they have put out information stating SA over the past 12 months has produced ‘ON AVERAGE’ 50%+ energy from renewable’s (mainly wind). What use is this AVERAGING, we need energy to be there when needed, averaging means nothing as the wind could be blowing hard at midnight and doing doing very little at 9am and throughout the day. Maybe they are looking for us to live in the wind capital of the world where it blows at gale force day and night non stop, could they think they can make that happen – after all they all believe int he power of the wind gods. But then AEMO wants to have better wind forecasting so how do they propose to forecast when the gusts will hit and if they will be at the turbine sites? Mind you AMEO, the SA Government and the ideologically challenged supporters of wind energy would be happy to solve this problem by having turbines carpeted across the whole State to ensure no wind action could go ‘unused’. Plenty of conflicting ideas and thought bubbles going on amongst the ‘powers that be’. We constantly here the term Tornado used to describe the wind which toppled the transmission lines, but where are the pictures of destruction to the landscape along the route of the ‘tornado’s’, where are the ripped apart buildings and dead animals strewn across the land as they were picked up and thrown back down by swirling winds? I haven’t heard if any investigation was or is being conducted into why the transmissions lines fell in a dominoed action. Surely there is a design or installation weakness which allowed this to happen. Could it happen again? Finally the story AEMO tells of the unknown software programming – what unknown programming, we all knew they were fitted with an ‘off’ switch when things got too tough, and why didn’t AEMO have access to the operating specifications of these things, surely they are not covered by commercial confidentiality where AEMO or indeed any other authorising party as this information is needed to be able to organize smooth operation of turbine plants and the Grid they are connected to. An oversight on AEMO’s part in not requesting them or simply an excuse to short-circuit blame away from them. They say this software situation has now been resolved and somewhere (probably Adelaide Advertiser) I recall reading they now believe the turbines are performing better. The evidence does not correspond with the last statement. Looking at performance of individual projects in SA’s mid north over the past 12 months indicates there has been no alteration to performance. So no change to performance – maybe they meant there would no further problems with the turbines shutting down – just blowing up if they cannot switch off when the going gets too tough. The fact remains, a storm should not wipe out an entire State. Queensland has just been through a Cat 4 Cyclone. And yet there was no Statewide blackout. Something is clearly wrong with the reckless way the Weatherill Government has destroyed their once reliable grid. South Australia is at war with itself on this ideological path to self destruction. ERM energy’s Lincoln gap wind farm (212mw) just west of Pt Augusta in SA announced today that it had obtained a PPA with Nexif energy. Despite the spruik by Gilligan at Ruin the economy in which he paints a picture of jubilation, he then admits the project isn’t yet at financial closure. Please tell me with SA at already at its 50% renewable target that the lunatics aren’t going to allow any more wind generation in SA to be built. Didn’t Jays bail out energy plan state that retailers would have to buy an increasing amount of scheduled generation? Why would Engie turn on its second generator if there was going to be more wind farms built. Unless of course the consumer has to pay for back up power as well as renewable generation? When will we have cheap reliable power in SA Koutsy?